Success! The second stage and payload have arrived at their initial parking orbit. Now awaiting re-ignition of second stage to place the payload into its proper transfer orbit. Looks like it was a successful launch. Seeing the thermal glow on the exhaust nozzle was impressive. Payload separation confirmed! Mission was fully successful! What is it at 30:56? It is a fuel in the tank? As HD said, yes (second stage LOx tank, I think) - on the previous launch, there were more shots of the interior of the tank, including one at the moment of SECO (Second stage Engine Cut-Off), which, while heavily garbled in transmission, was utterly beautiful. Liquid in zero-G is always mesmerising. I would have guessed the RP-1 tank. Much less severe conditions in there for placing cameras. Also, wouldn't the LOx have a noticeable blue color? It was a total guess, but now you mention it, yeah - a camera would likely freeze in the LOx tank. EDIT: Pressed save too soon. SpaceX are targeting the 19th of September for Cargo Resupply 4, their fifth (if I'm counting correctly) supply run to the International Space Station for NASA. 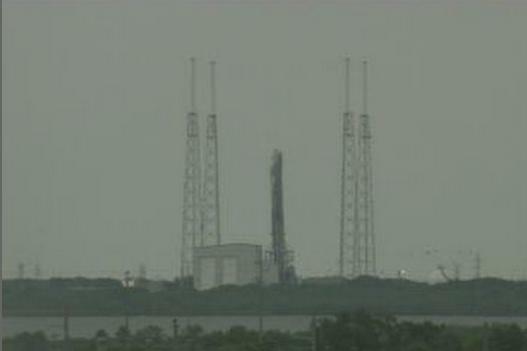 It'll take off, if all goes to plan, at 06:38 UTC. Due to a production order shuffle, one of the AsiaSat launches got the core destined for this mission, with strong thrusters and hinges but no legs attached - so CRS-4 will be a vanilla F9 1.1 core, with no legs and weak thrusters, just like Cassiope. They will attempt a splashdown of the first stage, but they don't expect a significantly better outcome than Cassiope (when the first stage touched the ocean intact, but moving at about 100kph). If they manage to launch at the currently appointed time, it'll nearly half their company record for the fastest turnaround - from 22 days to 12. That's only one day off the American record, and must surely be the fastest launch turnaround on a single pad in decades. The static fire test is due for the 17th. The CRS-4 launch has been rescheduled by NASA to 02:16 EDT (06:16 UTC) on the 20th of September - about 23 hours later than planned. That's stupidly early in the morning here, so I think I'll be watching this one after the fact on YouTube. On board will be supplies, cargo, and experiments - including the SpinSat inexpensive satellite technology demonstrator, a 3D Printer IN SPACE!! !, and a Planetary Resources Arkyd 3 telescope satellite. I'm not sure if that's the first PR hardware in space, but it's pretty damn cool. It might be the first piece of commercial mining hardware in space. 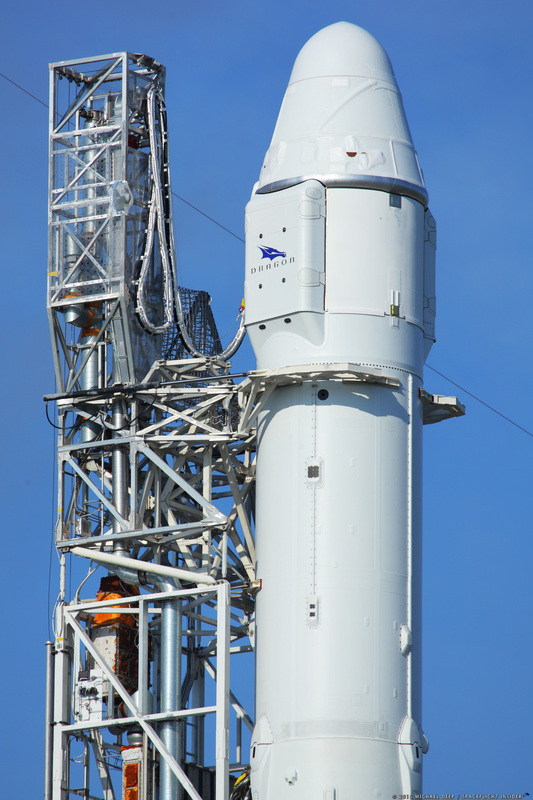 CRS-4 Static fire has been completed successfully. There's a camera at SLC-40 taking photographs every 60 seconds and overwriting the same jpg. It's coloured bars at the moment, but I think it does that in darkness - click here to check for yourself. Anyway, the point is that, via that camera, I was able to see Falcon 9 just prior to, and just after, erection. 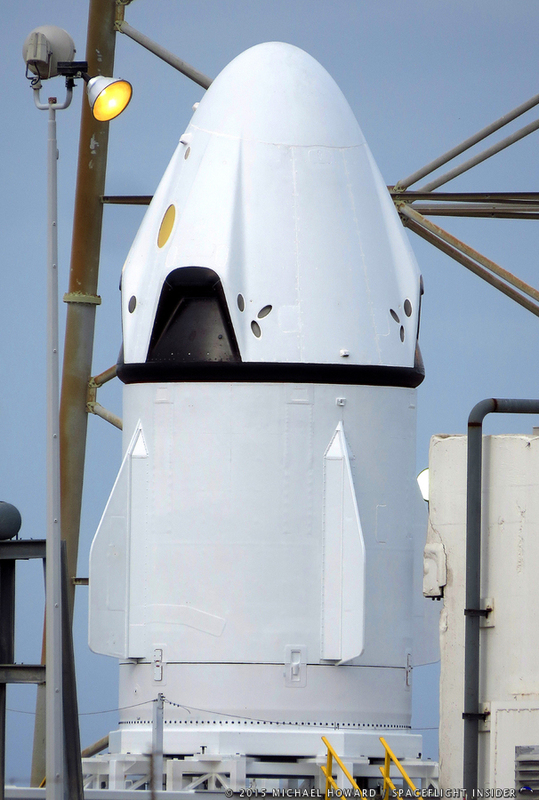 Dragon was already mated to the rocket! So they're good to go on that front. T-1 day and just under 19 hours as of right now. The instantaneous launch window to the ISS is 20 Sep 2014 06:14:00 UTC. “An alternate date of 9/21, at 01:52 is available. SpaceX is working toward a second alternative date of 9/22, at 01:29 – pending Range approval.” - NASA Spaceflight Forum article. There will be a splash-down attempt on this launch (to repeat myself), but since this rocket is the same configuration as the Cassiope splashdown attempt last year - with no legs to add aerodynamic roll drag, and weaker thrusters than the legged version - this splashdown is quite likely to end in the same way: an uncontrolled spin about the long axis, centrifuging the fuel away from the engine ducts, and choking the engine after only partial deceleration, ending with a cold, rapidly spinning 100kph splat on the ocean's surface. Yet another beautiful launch tonight, with some of the best and most unique views we've ever had. 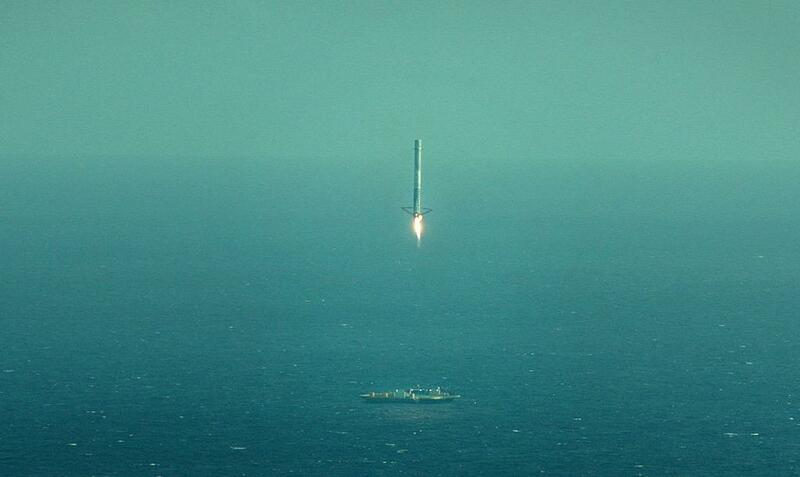 Congrats to SpaceX on pulling off a 13-day launch turnaround. SpaceX is like a less exlposive KSP space program, flinging up rockets on a ridiculously quick schedule, it's great to see how they are progressing. The TurkmenAlem52E/MonacoSAT launch, Turkmenistan and Monaco's first national communications satellites, which was originally due for March 21st (tomorow), has suffered a number of delays due to helium tank manufacturing issues identified in the factory, and is now expected to launch on the 24th of April. 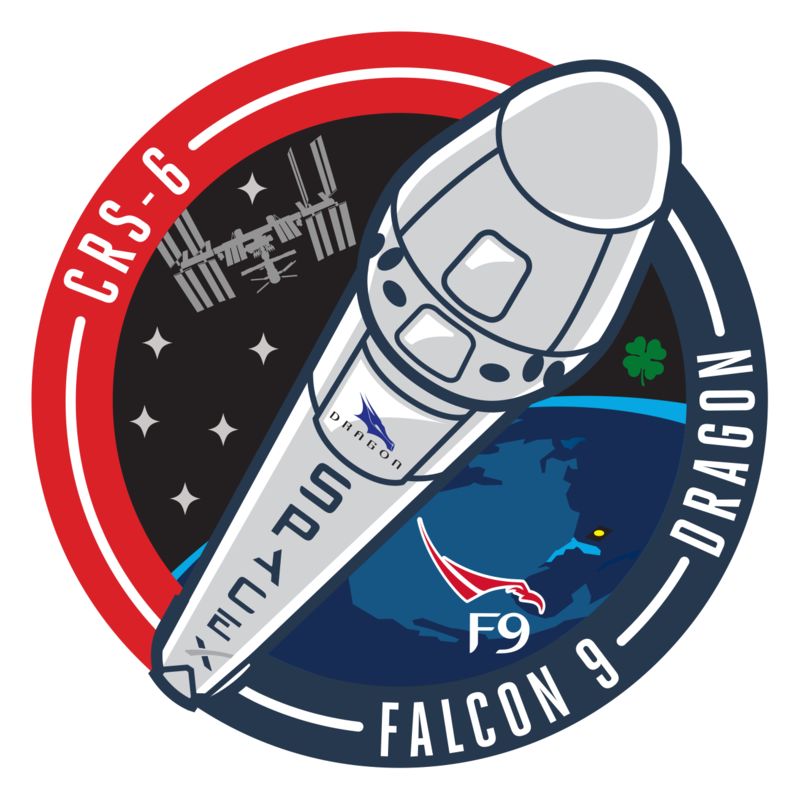 This has led to a re-shuffle in SpaceX's launch line-up for the year, with the next mission now being CRS-6, the 7th SpaceX Dragon ISS re-supply mission, still on-schedule for an April 10th blast-off. The bad news is that the Dragon 2 pad-abort test is likely to get pushed back til after the Turkmensat launch! However, there's good news: Our next launch, CRS-6, will include a landing attempt on the Autonomous Spaceport Drone Ship "Just Read The Instructions". Turkmensat will not, but the following flight, CRS-7, will, and I've heard that the core launching Jason-3 for NASA will sport legs and attempt a Drone Ship landing, too. Hopefully they'll nail the landing next time - the first core to be recovered will be inspected, and then shipped to Spaceport America in New Mexico to begin re-usability demo flights, in place of the now-cancelled F9r-Dev2 vehicle. 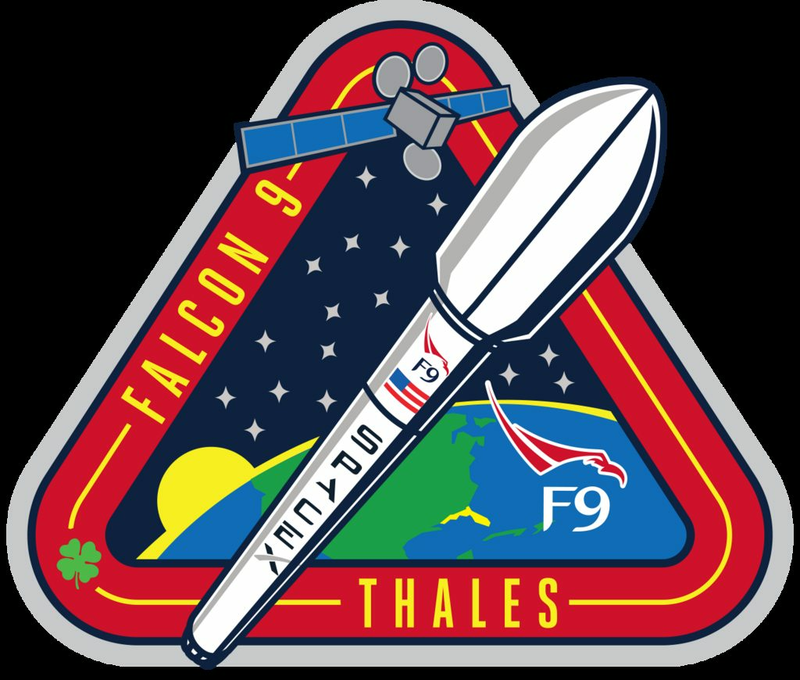 After those four launches - CRS-6, TurkmenAlem52E/MonacoSAT, CRS-7, and Jason-3, SpaceX will roll out an upgraded Falcon 9 to launch the SES-8 satellite. "Upgrades in the works to allow landing for geo missions: thrust +15%, deep cryo oxygen, upper stage tank vol +10%"
"So what we've done is we've gone back, got that extra performance from those engines, and we're going to place them on the new vehicle, the new spin. I don't know what we're going to call it. 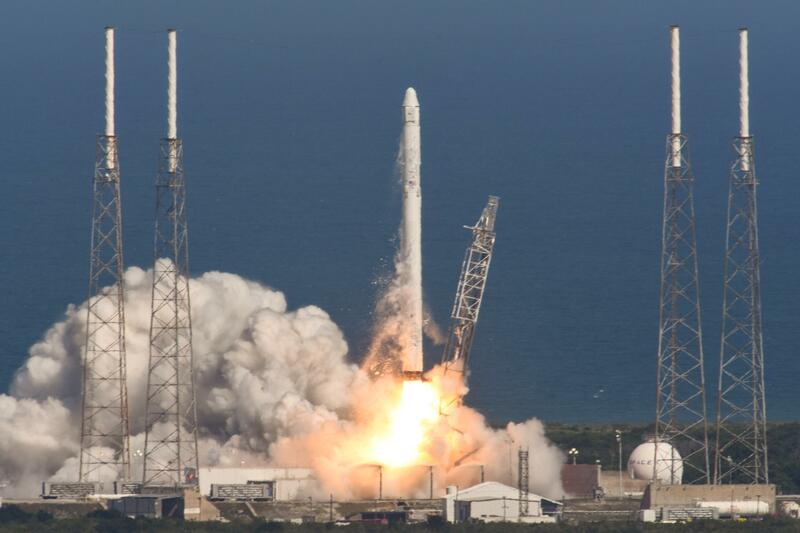 Enhanced Falcon 9, Falcon 9 v1.2, Full-Performance Falcon 9." "So, we got the higher thrust engines, finished development on that, we're in qual. What we're also doing is modifying the structure a little bit. I want to be building only two versions, or two cores in my factory, any more than that would not be great from a customer perspective. 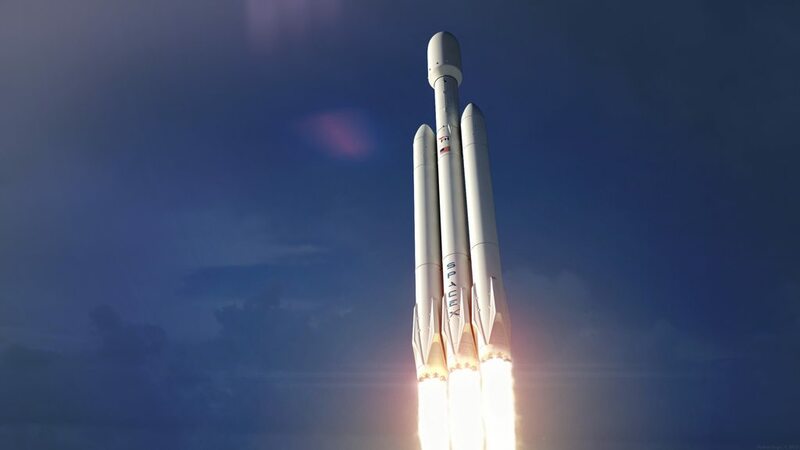 So Falcon Heavy is two different cores, the inner core and then the two side boosters, and the new single stick Falcon 9 will basically be a Falcon Heavy side booster." As things currently stand, the launch following SES-8 is the inaugural launch at SpaceX's newly refurbished SLC-39A pad (formerly an Apollo and Shuttle pad), of the maiden voyage of the Falcon Heavy rocket, so it all seems to be coming together rather synergistically. Today's launch of the Falcon 9 v1.1 carrying a Dragon version 1 full of cargo to resupply the ISS on the CRS-7 mission for NASA was a resounding success! A launch attempt was made the day before, but a lightning cloud strayed into the exclusion zone 3 minutes and 7 seconds before launch, causing the ROC to hold the launch countdown, scrubbing the attempt. @ElonMusk: Looks like Falcon landed fine, but excess lateral velocity caused it to tip over post landing. All we have right now [from the cameras on the Drone Ship] is low frame rate video (basically pictures). Normal video will be posted when ship returns to port in a few days. 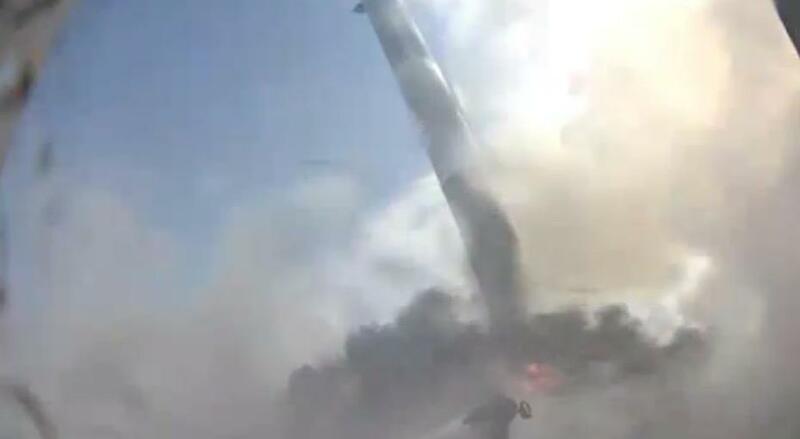 "Either not enough [RCS] thrust to stabilize or a leg was damaged. Data review needed." @ElonMusk: @ID_AA_Carmack Looks like the issue was stiction in the biprop throttle valve, resulting in control system phase lag. Should be easy to fix. Which bodes very, very well for CRS-7. I'm bummed they didn't make it this time, but THRILLED that they got SO CLOSE! Did you notice Dragon's new logo? 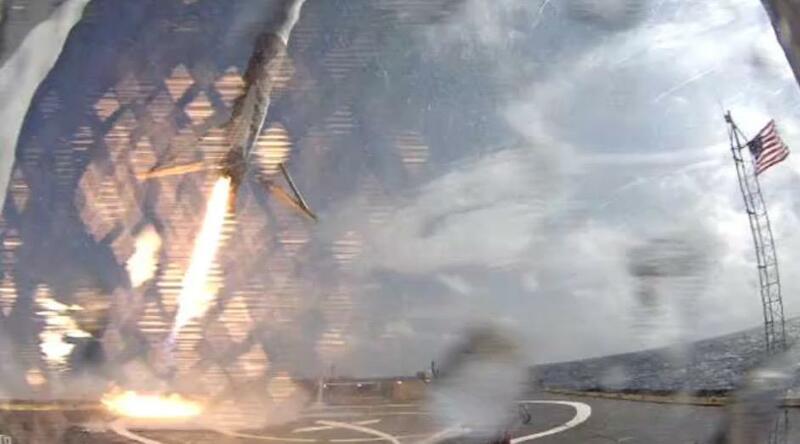 Crash footage FROM ABOARD THE DRONESHIP! Excellent SpaceX.com blog post about the Pad Abort test.